MIAMI | Vilma Angulo remembers Sister Jean Rosaria Fisch as having the interview skills of an FBI agent, balanced with the ability to make everyone feel loved and welcomed. An Adrian Dominican, Sister Jean worked in pastoral ministry at St. Gregory Church, Plantation, from 1991 until last year. Throughout that time, Angulo said, she made it a point to register every parishioner personally. Sister Jean Rosaria Fisch, 86, who died Sept. 8, had been an Adrian Dominican for 68 years and spent 58 of those ministering in South Florida, mainly at St. Rose of Lima in Miami Shores and St. Gregory in Plantation. Sister Jean died Sept. 8 at the Dominican Life Center in Adrian, Michigan. She was 86 and in the 68th year of her religious profession, having spent 58 of those years in South Florida. For 15 years, from 1965 to 1980, she served as teacher and principal at St. Rose of Lima School in Miami Shores. She then served in pastoral ministry for 37 years, 11 at St. Roseand 26 at St. Gregory. She had taught at St. Rose from 1952 to 1953, and at Little Flower, Hollywood from 1960 to 1965. She also taught at schools in Grosse Pointe Farms, Michigan, the Dominican Republic and Puerto Rico. Angulo met Sister Jean in the summer of 1991, when she interviewed with her and the late Msgr. Noel Fogarty for the position of DRE at St. Gregory. 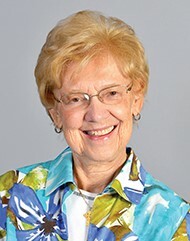 Sister Jean’s initial title at the Plantation parish was director of parish ministries. “Of course that didn't work. They were also extraordinary ministers of Communion, led marriage ministries, youth groups, prayer groups, children's groups — all the ministries that she so lovingly coordinated,” Angulo recalled. Sister Jean was born in Appleton, Wisconsin, and graduated from Rosarian Academy in West Palm Beach. She earned a Bachelor of Arts degree in history and a Master of Science degree in administration/school supervision, both from Barry University in Miami Shores. A funeral Mass was celebrated Sept. 12 at St. Catherine Chapel in the Dominican Life Center in Adrian. She was buried in the community’s cemetery. Incline Thine ear, O Lord, unto our prayers, wherein we humbly pray Thee to show Thy mercy upon the soul of Thy servant Sister Jean whom Thou hast commanded to pass out of this world, that Thou wouldst place her in the region of peace and light, and bid her be a partaker with Thy Saints. Through Christ our Lord. Amen. Sending prayers and condolences for Sister Jean. I very much enjoyed working with her in various Ministries over the years. May her soul rest in peace with our Lord.